Risk assessments are undertaken by EPA officers in consultation with licensees. A risk assessment tool has been developed by the EPA to evaluate the impacts associated with a licensed premises and the likelihood of environmental harm occurring. The risk assessment process is an opportunity for licence holders and EPA officers to discuss the environmental performance of individual premises and how improvements to operations can be put in place if needed. environment improvement programs initiated by the licensee. The environmental management category is also used in the calculation of the licence administrative fee. See the Environmental management calculation protocol for further information. The results of the risk assessment are used to determine the overall environmental risk associated with the licensed activity: from Level 1, to Level 3, with Level 3 being the highest risk. The risk assessments assist the EPA to focus its regulatory activities on high risk licensees. Licensees with a higher risk level receive an increased level of regulatory and compliance oversight, whereas licensees with a lower risk level benefit from reduced red tape and a reduced regulatory burden. A higher risk level may result in more intensive monitoring and reporting obligations on the licence. Environmental risk levels for each licence will be made available on the EPA's Public Register as they are determined, providing the community with more information about the environmental risks and environmental performance of individual licensees, and the EPA's regulatory decisions. It should be noted that assessments are based on the environmental risks associated with a premises-based activity. The risk assessment process does not apply to licences issued for the transport of trackable waste. For further information on what the EPA considers when defining risks posed by licensed activities under risk-based licensing risk refer to regulatory priority and risk. Environmental management categories will be assessed every 12 months, in conjunction with the receipt of the annual return, and be based on a licensee's regulatory performance at their premises over a three-year period. Any annual changes in environmental management category associated with the licensed activity could result in a change in the licensed activity's overall environmental risk level. Licensees are able to request that the EPA review the risk level allocated to their activities. The EPA has developed internal review guidelines (PDF 114KB) to assist licensee request a review. 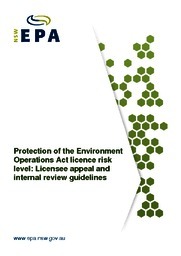 Licensees requesting a review of licence risk levels should contact the local EPA regional office to discuss the matter. Licensees must fill out an application form (DOC 103KB) to formally request a review of the licenced activity's risk level. Please note that the existing external review mechanisms (judicial review and merit appeals processes) regarding the EPA's environment protection licensing decisions are also available to licensees.